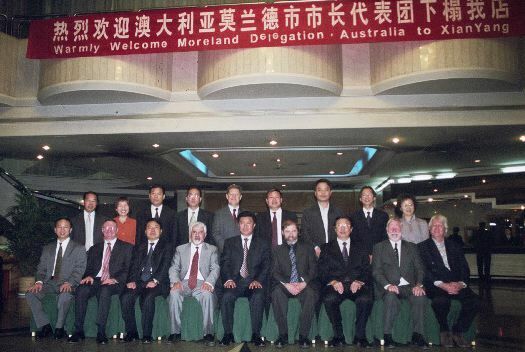 The Delegation from Moreland arrived in Xianyang on October 30, 2006 and received a warm welcome from the City Administration. The Delegation from Moreland is welcomed by the Mayor of Xianyang, Qian Junchang (centre front). The Sister-city Relationship betwen Xianyang and Moreland (and formerly Brunswick) goes back to the early 1990s. Brunswick initiated and then formally entered into a Special Relationship with the City of Xianyang in 1995. After the formation of Moreland out of Brunswick and Coburg, and a democratically elected Council in 2000, the relationship with Xianyang was endorsed by Moreland City Council. Since then China has emerged as a developing economic powerhouse. As a result, interest has grown amongst Australian businesses of all sizes in establishing links with China to explore potential economic opportunities. Active local government relationships offer a unique entre to meet potential partners in the other country. In the early stages, the relationship between the two ciites was promoted by cultural and artistic exchanges. Similarly, in this case, the Moreland Delegation was preceeded by a field trip of public art students from RMIT University to carry out public art projects around Xianyang . However the motivation of this Delegation from Moreland was to explore the potential for a broader basis for co-operation in the areas of education and business. Although most of the Moreland Delegation didn't know each other before going to China, it soon coalesced into a tight-knit group. New friendships were established and much fun was had during the five days together. A short introduction to each of the delegation members and their interests is given on a separate web page. visit Art Department, Xianyang Normal University to meet staff and student musicians and members of the Xianyang Musicians Association. Performance by Xianyang musicians.